This dish is inspired by a recent lunch at Jaleo, where Chris and I started our meal with two salads: a beet salad with grapefruit, oranges, pistachios and frisée and a fennel-apple salad with Manchego, a Spanish cheese that Whole Food sold aged 3, 6 or 12 months. I tossed together ideas from both salads to come up with this dish, which I think would be a perfect simple salad to serve for Thanksgiving. 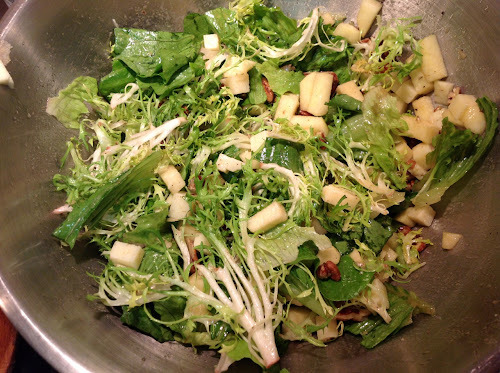 Combine pecans, cheese, apple, lettuce and frisée in a large bowl. Whisk together oil, vinegar, mustard, honey, salt and pepper. Toss salad with vinaigrette.